The lateral force mode kit provides everything that is required to perform lateral force imaging with your AFM. 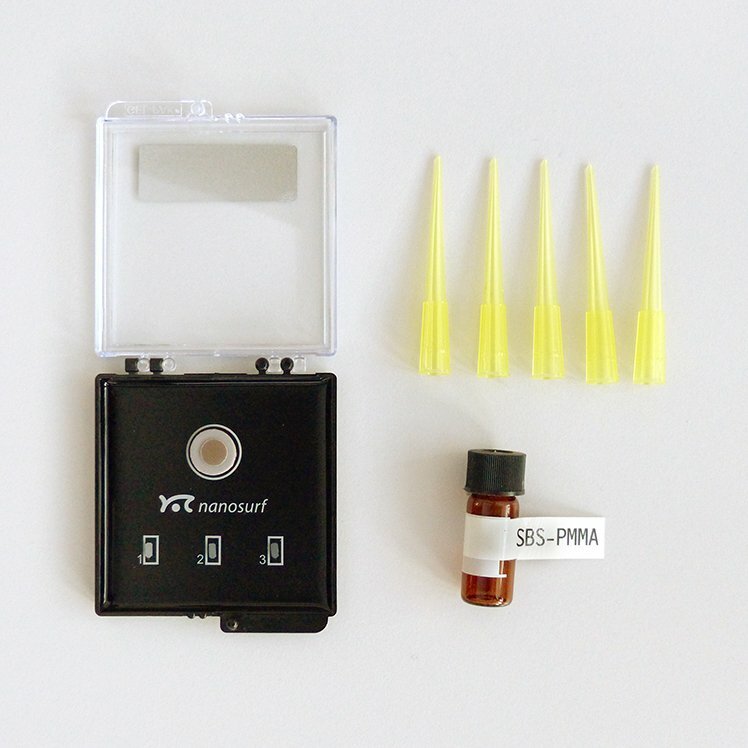 The kit comes with a set of cantilevers and a polymer blend sample composed of poly(styrene-butadiene-styrene) (SBS) and poly(methyl methacrylate) (PMMA) that can be easily prepared on site to always start with a fresh and clean sample surface. The SBS-PMMA polymer blend sample exhibits islands that vary in size from sub-micrometer to several micrometers in diameter. The islands show lower friction compared to the surrounding matrix. Depending on the preparation, also different levels of friction can be observed in the matrix, probably arising from different degrees of polymer unmixing during solvent evaporation. Lateral deflection of the cantilever can be caused by either friction between the cantilever tip and the sample or by topography effects. To separate topography-induced from friction-induced lateral deflection, the average and difference between the forward and backward motion can be calculated (see scheme above). Using image post-processing the respective images can be calculated and mapped to the topography of the sample. Without calibration of the lateral spring constant and sensitivity of the cantilever, only qualitative conclusions can be drawn from the lateral force images. Recently, Dziekonski et al. developed a MEMS microforce sensor for simple and direct measurement of the lateral force calibration constant.